Description: 4-1/2" time track diameter paper clock dial. 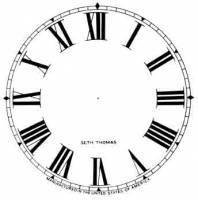 Roman numerals with the E.N. Welch trademark. White. Description: 5" time track diameter ivory paper clock dial. Roman numerals with an Ingraham trademark. Description: 4-1/2" time track diameter ivory paper clock dial. Roman numerals with a Gilbert trademark. 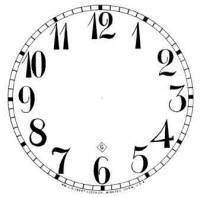 Description: 5" time track diameter white paper clock dial. Roman numerals with a Kroeber trademark. Description: 5" time track diameter paper clock dial. Arabic numerals with the Sessions trademark. White. Description: 4-1/2" time track diameter paper clock dial. Arabic numerals with the E.N. Welch trademark. White. Description: 5" time track diameter ivory paper clock dial. Arabic numerals with an Ingraham trademark. 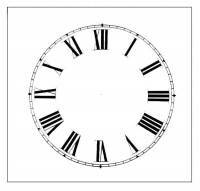 Description: 4-1/2" time track diameter ivory paper clock dial. Arabic numerals with a Gilbert trademark. Description: 5" time track diameter ivory paper clock dial. Roman numerals with a Kroeber trademark. Description: 5" time track diameter paper clock dial. Roman numerals with the Seth Thomas trademark. White. 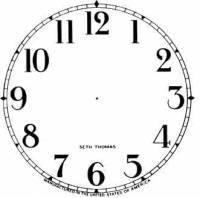 Description: 11" time track diameter ivory paper clock dial. Roman numerals with an Ansonia trademark. Description: 5" time track diameter ivory paper clock dial. Roman numerals with a New Haven trademark. Description: 4-1/2" time track diameter ivory paper clock dial. Roman numerals with an Ingraham trademark. Description: 9" time track diameter paper clock dial. Roman numerals with the Waterbury trademark. White. Description: 5" time track diameter paper clock dial. Arabic numerals with the Seth Thomas trademark. White. Description: 11" time track diameter ivory paper clock dial. Arabic numerals with an Ansonia trademark. Description: 5" time track diameter ivory paper clock dial. Arabic numerals with a New Haven trademark. Description: 4-1/2" time track diameter ivory paper clock dial. Roman numerals with a New Haven trademark. Description: 9" time track diameter ivory paper clock dial. Roman numerals with an E.N. Welch trademark. 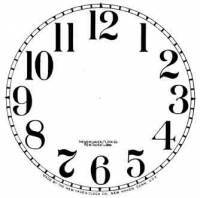 Description: 11" time track diameter paper clock dial. Roman numerals with the Ansonia trademark. White. Description: 5" time track diameter paper clock dial. Roman numerals with the Waterbury trademark. White. Description: 11" time track diameter ivory paper clock dial. Roman numerals with an Ingraham trademark. Description: 5" time track diameter ivory paper clock dial. Roman numerals with a Sessions trademark. 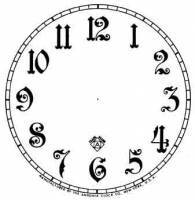 Description: 4-1/2" time track diameter ivory paper clock dial. Arabic numerals with a New Haven trademark. Description: 4-1/2" time track diameter ivory paper clock dial. Roman numerals with a Kroeber trademark. 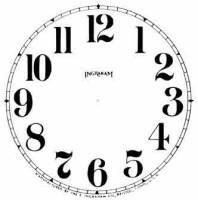 Description: 11" time track diameter paper clock dial. Roman numerals with the Gilbert trademark. White. Description: 5" time track diameter paper clock dial. Arabic numerals with the Waterbury trademark. White. Description: 11" time track diameter ivory paper clock dial. Roman numerals with a New Haven trademark. Description: 5" time track diameter ivory paper clock dial. Arabic numerals with a Sessions trademark. Description: 4-1/2" time track diameter ivory paper clock dial. Roman numerals with a Sessions trademark. Description: 4-1/2" time track diameter ivory paper dial has roman numerals. No trademark (plain). 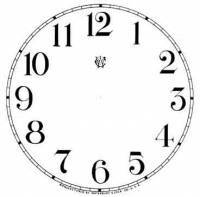 Description: 11" time track diameter paper clock dial. Arabic numerals with the Gilbert trademark. White. Description: 5" time track diameter paper clock dial. Arabic numerals with the E.N. Welch trademark. White. Description: 11" time track diameter ivory paper clock dial. Roman numerals with a Sessions trademark. Description: 5" time track diameter ivory paper clock dial. Roman numerals with a Seth Thomas trademark. Description: 4-1/2" time track diameter ivory paper clock dial. Arabic numerals with a Sessions trademark. Description: 11" time track diameter paper clock dial. Roman numerals with the Sessions trademark. White. Description: 5" time track diameter white paper dial has roman numerals. No trademark (plain). Description: 11" time track diameter ivory paper clock dial. Arabic numerals with a Sessions trademark. Description: 5" time track diameter ivory paper clock dial. Arabic numerals with a Seth Thomas trademark. Description: 4-1/2" time track diameter ivory paper clock dial. Roman numerals with a Seth Thomas trademark. Description: 5" time track diameter paper clock dial. Roman numerals with the Ansonia trademark. White. Description: 4-1/2" time track diameter paper clock dial. Roman numerals with the Ansonia trademark. White. Description: 11" time track diameter ivory paper clock dial. Roman numerals with a Seth Thomas trademark. Description: 5" time track diameter ivory paper clock dial. Roman numerals with a lWaterbury trademark. Description: 4-1/2" time track diameter ivory paper clock dial. Arabic numerals with a Seth Thomas trademark. Description: 5" time track diameter paper clock dial. Arabic numerals with the Ansonia trademark. White. Description: 4-1/2" time track diameter paper clock dial. Arabic numerals with the Ansonia trademark. White. Description: 11" time track diameter ivory paper clock dial. Roman numerals with a Waterbury trademark. Description: 5" time track diameter ivory paper clock dial. Arabic numerals with a Waterbury trademark. Description: 4-1/2" time track diameter ivory paper clock dial. Roman numerals with a Waterbury trademark. Description: 5" time track diameter paper clock dial. Roman numerals with the Gilbert trademark. White. Description: 4-1/2" time track diameter paper clock dial. Roman numerals with the Kroeber trademark. White. 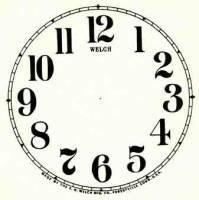 Description: 11" time track diameter ivory paper clock dial. Arabic numerals with a Waterbury trademark. Description: 5" time track diameter ivory paper clock dial. Roman numerals with an E.N. Welch trademark. Description: 4-1/2" time track diameter ivory paper clock dial. Roman numerals with an E.N. Welch trademark. Description: 5" time track diameter paper clock dial. Arabic numerals with the Gilbert trademark. White. Description: 4-1/2" time track diameter paper clock dial. Roman numerals with the Ingraham trademark. White. Description: 7" time track diameter ivory paper clock dial. Roman numerals with an E.N. 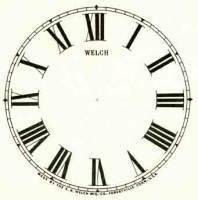 Welch trademark.